In April, 1860, David R. Nelson of Jackson, Ohio, patented (US patent №28006) a keyboard machine for adding numbers, one of the early calculators of that type, after the machines of White, Torchi and Schwilgué in Europe, and the key adders of his compatriots Du Bois D. Parmelee, Orlando Lane Castle, Thomas Hill and Leonard Nutz. 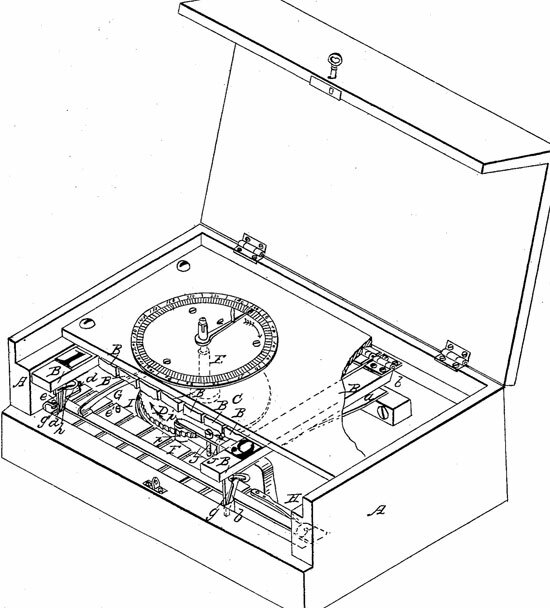 The machine (see the lower patent drawing) had five finger keys (marked with B) hinged at Z; to box A. Each key is provided with a spring a used to return it against the stop board C after depression. D is a ratchet wheel journaled in the box A and stop board C, and carrying on the upper end of its spindle an index or pointer c, adapted to move over the face of the dial E). The teeth on the periphery of the wheel D are equal in number to the divisions or units on the dial E so that a rotation of the wheel to the extent of a given number of teeth carries the finger of the dial over the same number of divisions or units on the dial. J, J, are springs provided with friction pads i made to press on the face of the wheel D to prevent its being carried by momentum to a farther extent of rotation than that given it by the lever and pawl F, G. The pressure of the said springs is adjustable by a set screw j. The check pawl I may, if preferred be dispensed with, the friction pads i serving to prevent the retrograde motion of the wheel D.
The index c is constructed with a spring socket so that it may turn with the spindle of the wheel D, yet be free to be set by hand independently of wheel D to any desired position on the dial. Almost nothing is known about the inventor—David R. Nelson. He was born in 1835 in Jackson county, Ohio, as the third child of John Nelson (1805-1885) and Mary Polly Nelson, nee McBride (1802-1880). David had an older brother—Absolom F. Nelson (1830-1920) and a sister—Mary Ann Nelson-Hastings (1832-1874). John Nelson (known as "Landlord Nelson") was a pioneer settler of Jackson, Ohio, and local businessman. He was a merchant, kept a store, and owned and conducted "Nelson's Hotel", one of the very early taverns, so most probably the young David devised his calculator to assist his father's business. David R. Nelson died on 5 April, 1890, in Jackson county, Ohio.